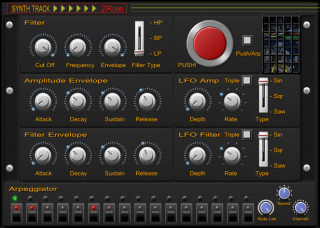 2Rule has released SynthTrack: a free effect plugin that can shape audio files using filters, LFOs and even an arpeggiator. The idea is to apply parameters usually found in synthesizers to audio tracks. It will be a great tool for pads and chords, for example. The interface is totally straightforward: at the bottom, there’s the 16-step arpeggiator. When the user activates a step button, it will turn the audio volume on. This sequence of on/off sounds is responsible for the rhythmic sound. At the left, there are three buttons: Note Lenght, Speed and Interval. Note length will act as a decay knob: lower values will fade the sound faster. Speed knob will set the arpeggiator speed. Interval knob will set the number of the arpeggiator steps (1 to 16). The Filter section at the top has knobs for Cutoff, Frequency and Envelope, as well as a Filter switch with 3 filter types: high pass, band pass and low pass. The Amplitude Envelope section has typical ADSR knobs. At the right, an LFO will modulate the amplitude according to Depth and Rate settings. Turn on Triple button to activate triplet divisions. A Type switch will make possible to choose between three waveforms: sine, square and saw. The Filter Envelope section also comes with ADSR controls and an identical LFO section. Start tweaking those parameters to create interesting sounds. At the top right, there’s the big red Push button. Activate it by turning on the Push/Arp button, which will automatically deactivate the arpeggiator. It will work as a one-shot gate, creating awesome patterns. A great improvement for this plugin would be to include a midi learn feature. It will make SynthTrack even more impressive. – Mac and Windows formats. 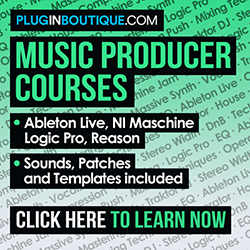 You can download SynthTrack for free on 2Rule website.